I love my tattoos. I know they’re not everyone’s preference. But for me, they truly are a creative and artistic expression. Every tattoo I have, I considered thoughtfully, sketched and planned. I didn’t get drunk one night and wake up with a tramp stamp. However, I do have a tramp stamp. I would like to note that the term became popular in the 2000s. I got my first tattoo which happens to be on my lower back in 1997. I remember being excited. I had drawn out my idea based on a sticker I had. It’s two dolphins nose to tail in a circle. They also have flowers on their heads. My bestie went with me. It’s was a place in Greensboro near the UNCG campus. It was a long session. It’s a sensitive area. What kept it from hurting so much was that I couldn’t see myself bleed. I also may have crushed my friends hand.I loved how it turned out. I still love it, and it still looks bright with little fade. It was something I’d been waiting a while to do. I delayed getting my first tattoo until after my mom passed. As open minded and great as she was, she wouldn’t have liked it. It was a while before my next tattoo – 11 years. For my 30th birthday, I was ready for my next lifelong expression. I stayed with my back as canvas. About 5 inches above the dolphins is a butterfly with the same color palette. It represented my actual metamorphosis. That probably sounds corny or cliche. I can assure you it’s completely genuine. I love the beauty and journey of the butterfly. This was the year my life changed completely and forever so it felt right to mark it. That same year, I started the practice of getting tattoos while traveling. To end the year, I went to Vegas. I was living with the mantra of just have courage. So I decided courage should mark my left inner wrist; a constant reminder to be better. A few years later I was visiting another bestie in San Diego. I was now beginning to keep a journal of all the tattoos I wanted and where they might go. I love words so most things were quotes, verses or just a word intermixed with animals. The next one was a Sara Bareilles song verse from “Many the Miles.” The verse is “I’ve been given this one world, I won’t worry it away.” Love it; something I try to live by. It’s located between my shoulder blades. The next tattoo was written for my mom, which may sound strange since she wasn’t a fan of tattoos. It was more for me though. To keep her presence near me and remind myself of why I need to keep wanting to be better. The 10 words are inked into my right forearm: I never lost you I carry you in my heart. I’m proud to say that many people have complimented it. And said it was beautiful. I will say that having a tattoo on my forearm has made me susceptible to having it grabbed by strangers mid-conversation. My only regret is that it’s purple. I’m planning to have it redone in black just to tone it down slightly. Courage is teal. I’d like to redo it in black as well. My most recent tats are from this year; a birthday outing with another bestie. 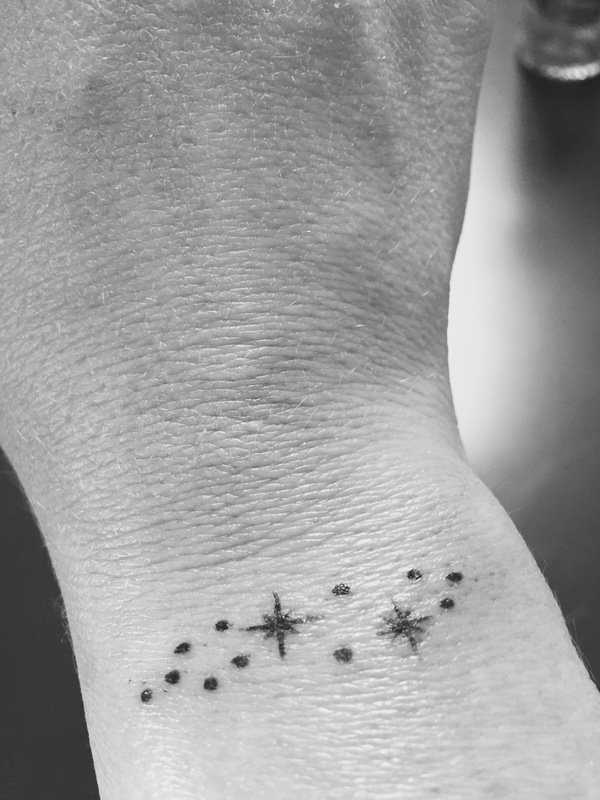 We both got constellation maps based on our sign: Pieces for me; Aries for her. We also both got semicolons. The semicolon tattoo is a symbol that at some point you thought you might end, but you didn’t. You kept going. You continued your life like a semicolon continues a sentence. I have three more that I’d like to get in the next year. They will be on my arms and back. Those are the only areas I tattoo. I’ve had friends comment to me over the years with concern that tattoos may interfere with my career. But that’s not really the case now. Most people and companies are more accepting of them. I can cover them up if necessary. Just don’t feel the need to. I would say now I don’t really get any negative feedback on them. Just yesterday I was ordering food at a restaurant and the gentleman serving me asked me about the tattoo on my forearm. He read it and said, “I really like that.” So maybe I provided him a little peace or a new way to consider loss. I don’t expect everyone to feel as I do about tattoos. We are all entitled to our own opinions. These opinions, we should all remember, are our own. I’m just want to express how I feel and what I believe. I just chose to do it on my skin. This entry was posted in life stories and tagged tattoos by bethfosborne. Bookmark the permalink.